With Christmas only a few short days away, have you already decided what to buy for yourself and your loved ones? Now, with Sony’s Christmas Treasures 2009 promo, attractive deals and discounts abound for your enjoyment, all for you to discover until January 17, 2010. For starters, becoming a newly-minted Handycam owner is now easier. Sony’s trade-in promo now allows you to turn in your old camcorder, no matter what brand or model you may have, to avail of discounts on the high-definition XR520/500, XR200/100 and CX100, or the colorful SR87/47, and SX60/40. Then, starting this Christmas, Sony is making available the Party-shot IPT-DS1, which leverages on Sony’s Face Detection and Smile Shutter Technologies, to become an “instant photographer” that detects the best picture composition and captures the most natural expressions. Other Christmas exclusives from Cyber-shot include an S-frame when you purchase the all new TX1, a free stylish case, a 4GB Memory Stick, and a mini tri-pod with the WX1, a free digital photo frame with a T900, and a free tripod and Sony Memory Stick with the T90. Aside from these digital imaging freebies to complement your Cyber-shot, your favorite camera brand also comes with either with a 6-month or 12-month O% interest. It is also a great season to own a BRAVIA, as you can now avail of unbelievably amazing discounts customized to fit your budget this Christmas. You can opt to use the value of your discount on BRAVIA Solutions, which covers products such as home theaters, Blu-Ray players, even Cyber-shot, Handycam, or Alpha DSLR cameras. Any of these products will be sure to elevate your home entertainment into a total BRAVIA experience. With Sony’s colourful and playful Cyber-shot T-series and Handycam S-series, sophisticated and sleek VAIO P laptops, slim and classy Sony Bravia X-Series, and the elegant and shimmering S-Frame with Crystallized Swarovsky Elements, your fashion-forward loved ones will be the toast of the stylish set. The Sony Cyber-shot H Series makes sure you capture every move and action on the field, while the Bravia Z-series and home theater makes you feel that you are right there in the game! Get fit with the Walkman W202 series which allows freedom of movement with its hassle-free build. Handycam and Cyber-shot cameras are made perfect for travel by their HD quality images and videos, as well as amazing portability. Meanwhile, relax anywhere and everywhere with the fun and convenient Walkman music players. Lightweight VAIO laptops assure that your loved ones can still connect with their friends and family even while on-the-go. Support your high-achieving loved ones with new Sony gadgets that combine effortless functionality with sophisticated design. Projectors, VAIO laptops and ICD recorders help them not only give their best, but also accomplish more. Not only are these Sony gadgets impressive in terms of sound quality and power, they are also impressive as accessories. Stylish with fun and playful design and build, the Walkman W, E and S-series help show individuality and creativity. Keep your sanity with Xplod units during the Christmas traffic and help keep the music alive with impressive Sony headphones. With Sony’s easy to use, premium home entertainment system, your loved ones can watch to their hearts’ content. Even when they are out-of-town or on the road, your loved one will still be able to catch the latest flicks with the new Sony VAIO models. And not only that, they may also make their own home videos with Handycam models that allow full HD quality. Capture the holiday with the Alpha digital SLR models, and show them off by displaying them in the elegant and functional Sony S-Frames with Crytallized Swarovsky Elements. Giving gadget gifts has never been this easy. 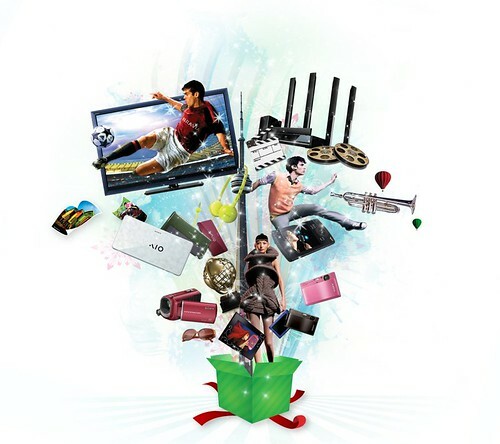 With its Christmas Treasures 2009, design and technology are brought together in a way that only Sony can, for you to spread a good dose of holiday cheer, without the hassle and with all the fun.